If you only have one day in Dubrovnik, I would suggest spending it on the City Wall Walk. It may be the highlight of your visit. It's a 2 km walk around the city with dramatic views of the coast and famous tiled rooftops. The wall was constructed between the 12th-17th centuries and surrounds the entire perimeter of Old Town. The walk can get crowded during the day, so try going early. We went when it opened, which was 8 am. There are several entrances to the Wall Walk. We chose the one close to the main street (Stradun), which was closest to Pile Gate. Once we got to the top of the stairs, we headed to the left. This will bring you to a view of Fort Lovrijenac. Nature combined with the man-made beauty of historic times creates a lasting impression. The width of the walls ranges from 13-20 feet on the landward side, but it's much more narrow on the seaward side. The walk takes you all the way around the port on the southeastern side of Old Town. In the distance, you can see St. Ivan Fortress. It was built in the 14th century and is now home to the Maritime Museum. The Wall gets pretty high in some places, so don't look down if you're afraid of heights. Minceta Tower was completed in 1464, now serves as a museum. Also known as the House of the Undying from GOTs. You may recognize this as the scene where Daenerys goes to get her dragons back. The walk takes about 1-2 hours, depending on how long you linger and/or take photos. We made it back in time to stop by the outdoor market for some fresh cherries and apricots. We took the cable car up to the top of Dubrovnik (on Hill Srd) around 6pm. It only takes 4 minutes to get from bottom to top, which is much faster than what it took when it was first constructed in 1969. The top of Srd is 412 meters above sea level, which provides for some spectacular views. We stopped by Dalmatino's for dinner, which is known for it's seafood. Hidden off of one of the alleyways in Old Town is Dolce Vita, and enticing place for dessert. Any day that ends with real gelato, probably means that it was a good day. Today was exceptionally wonderful. One more day left on this anniversary trip, and we hope to make the most of it. Game of Thrones or Real Life? We took a 3.5 hour ferry ride from Hvar to Dubrovnik (aka King's Landing). It was the one day out of our entire trip where it was rainy and cold for the majority of the day. Not a good day for traveling, but we made the most of it. From the ferry, we took the bus to Pile Gate, which is a drawbridge from the 1500s and the main entrance to Old Town Dubrovnik. It was our first glimpse into scenes filmed from Game of Thrones in Dubrovnik. Pile Gate is the arched entryway that is pictured here. This was used for many background scenes in Game of Thrones, including the Lannister procession. The main street of Old Town Dubrovnik is lined with many shops and restaurants. Be careful when it rains, the marble-lined floors are very slippery! Be forewarned...Old Town Dubrovnik has many steep steps (equivalent to about 8-10 flights of stairs). Thank goodness for our luggage backpacks! Highly recommended, as it would have been impossible for my wife to carry her luggage up those steep steps by herself. Like many European towns, the rooms are very small, but cozy. Apartments Bottega was in a very convenient location inside of Old Town Dubrovnik. The stone walls added a nice touch to the ancient architecture of the building. With Bosnia being a close neighbor to Croatia, Bosnian food is easy to find. Taj Mahal was one of such places and highly recommended. A small restaurant, so wait times may be long at peak hours. Another background scene used to film Game of Thrones; used for most of the market scenes in King's Landing. One of the most iconic steps in Game of Thrones, the Jesuit Stairs. You all know what was filmed here, the "Walk of Shame." Cersei's view before she descended on her Walk of Shame. The Dubrovnik Cathedral is a Roman Catholic cathedral that has been rebuilt several times due to war and natural disasters. Rector's Palace was closed for renovations while we were there, but it was used by elected rectors to govern Dubrovnik from the 14th century to 1808. It was also used for the scene where Daenerys asks the Spice King of Qarth for ships to take her army across the Narrow sea. Outdoor cafes in Dubrovnik are plentiful. The weather was cool in the evenings (late May) and the air was always filled with the sound of live music. The entrance to the oldest pharmacy in Europe, The Old Pharmacy in Franciscan Monastery that was built in 1317. Grk is a white wine that is made on the island of Korcula, which is another town that we visited earlier on our trip. Similar to a Pinot Grigio, Grk is a dry wine. Cities tend to take on a whole new personality at night. These are some of the same places that were visited earlier in the day. With a night like this, it's easy to allow one's imagination to wander. To a time of kingdoms, castles, and dragons. Far from a night that is "dark and full of terrors." Although night has fallen, the water is so clear and calm that you can see every rock and creature on the bottom of the sea. The bright lights reflect a rainbow of colors, and the misty clouds add to the dream-like trance of this historic land. This morning we took a ferry from Hvar to Korcula, which took about one hour. Korcula is known as the "mini Dubrovnik" of Croatia. It is an ancient town (said to be founded around the 12th century BC) that is surrounded by walls with a fort in the center. A quiet little town, perfect for photo opportunities without large crowds of tourists. Steps leading up to the Revelin Tower, which dates back to the 13th century. It is the southern entrance into Old Town. Walk around the outer perimeter of Old Town Korcula and you will see some of the best views you've ever seen. A perfect place to have lunch. There is a cocktail bar at the top of that tower called, Massimo. You have to climb a narrow ladder to get to the top. It was not open when we were there due to it being pre-season. However, it is said to have some great views. A walk around the outer perimeter of Old Town Korcula. Every door and building has it's own unique set of characteristics and history. Each one told it's own story. No telling how long this one has been there. This is very similar to Dubrovnik and Hvar where you have narrow alleys with lots of steps. 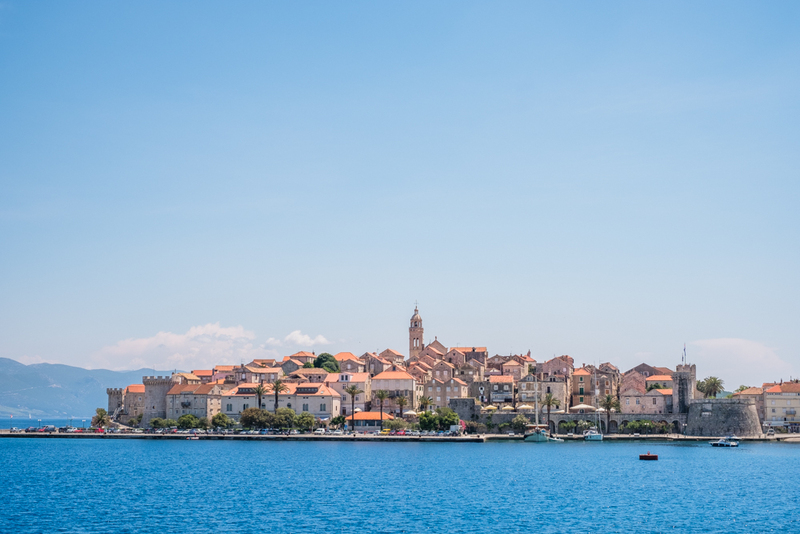 Korcula is said to be the birthplace of Marco Polo. This was his home. Because Korcula is such a small town, there is not a whole lot to do (especially in off-season). However, it's beauty makes up for what it lacks in activities. We literally had the whole beach to ourselves! We walked back to Old Town to have some ice cream at this cafe. Gelato is always a good choice in Europe. This refreshing melon gelato did not disappoint. As you can see, there were only a handful of tourists here in Korcula at the end of May. No lines or reservations needed for any of the restaurants! Pizza with prosciutto, mozzarella, sunny-side egg, and ricotta at Pape Pizzeria. My wife really loves pizza. Loves it to the point where she would eat it everyday if she could. She said that this beats the pizza we had in Italy (but NOT the calzone from Positano). We even had pizza in Naples...the BIRTHPLACE of pizza! She would go back to Korcula just for this pizza. My wife shared some (a little) of the pizza with me, but there were no leftovers. We stopped at this little cafe for dessert before heading back to the ferry. Homemade pies, cakes, cookies, and other sweet treats. Chamomile tea and a lemon tart. The lemon tart was delicious and not too sweet. So long, Korcula. You were lovely. Well-worth the day trip and memories that will linger in these photographs. We may have to return to you someday just so that my wife can have your delicious pizza. Until then, we will remember, "take every chance you get in life, because some things only happen once." This holds true for so many things, but today and for us, it means travel and see as much of the world as we can. It's never too early to cross things off your bucket list.